Sometimes I don't want to write headnotes. I want to skip any superfluous wording and head right to the recipe. This is one of those recipes - Crazy Easy Curried Pumpkin Soup that takes as little time as opening a can of soup would to heat. The smartest of smart supper recipes, I dare say. Let me wax poetically to you about the merits of canned pumpkin before we get to this game changing pumpkin soup recipe. We should all keep a few cans in our pantry this time of year. Pumpkin is full of fiber and antioxidants. 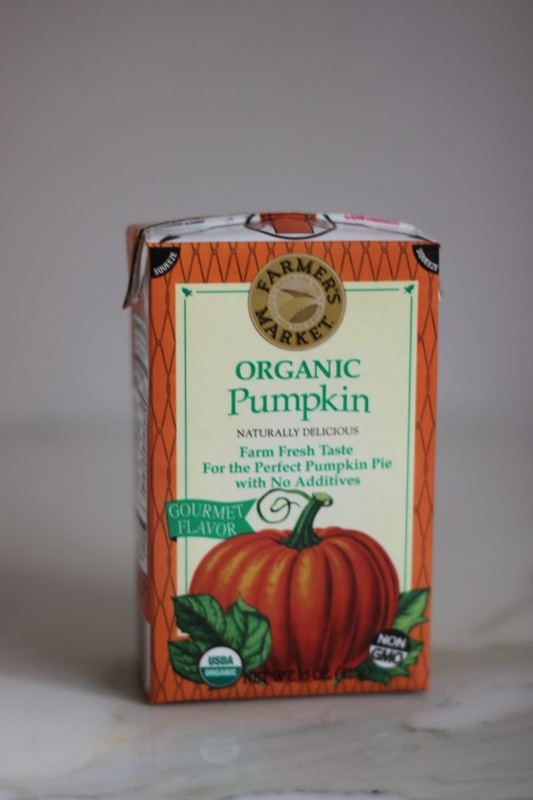 Canned pumpkin is one of the few products I would consider better than its fresh counterpart. Its also the secret for making this incredibly easy, fast, and delicious soup. You can also use it for a lot more than pumpkin pie! 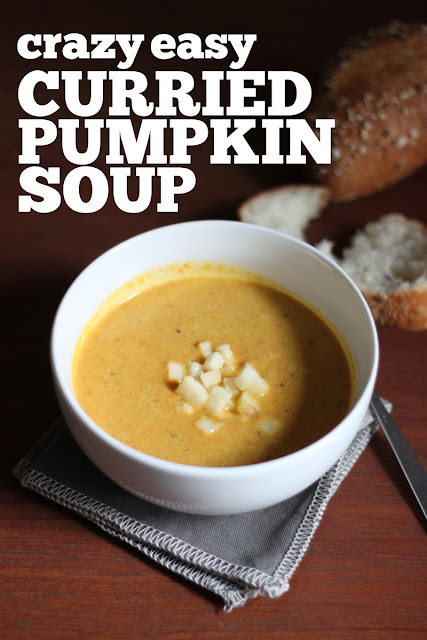 It would be easy (and delicious)to throw some pumpkin pie spice in this soup and call it a day. 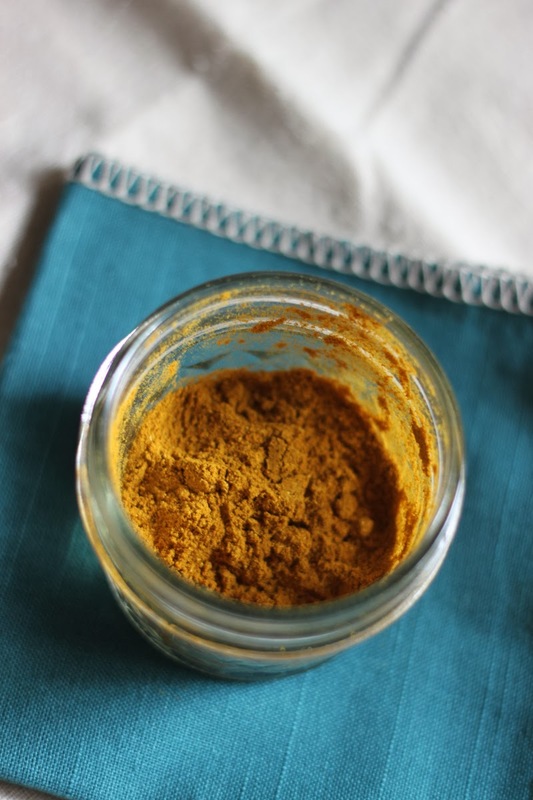 But cool fall weather makes way for warm, complex spices and curry powder fits the bill. Yes, you could make your own (this recipe is a good starting point) but it would take some of the ease and simplicity away from this recipe. The curry and ginger in this recipe don't make for an overtly spicy soup; My toddler ate this with gusto, much to my surprise. 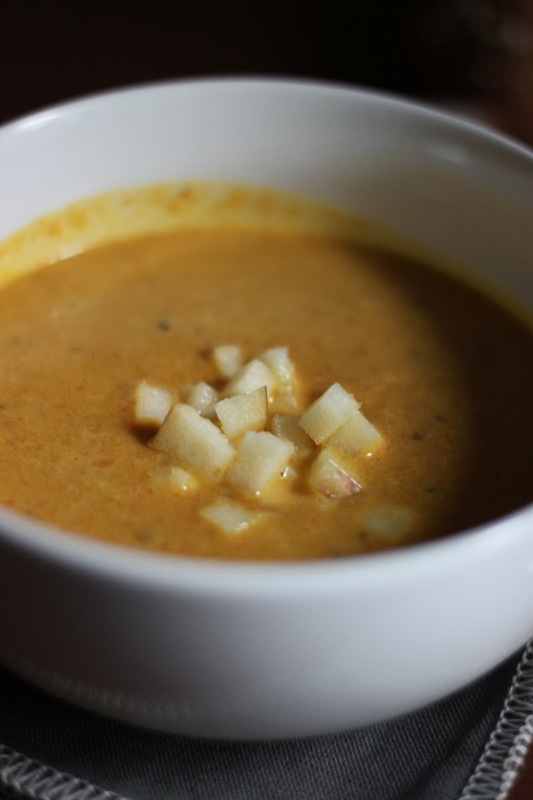 Topping the finished soup with finely chopped apple also adds a punch of sweetness and crunch to this otherwise creamy soup. 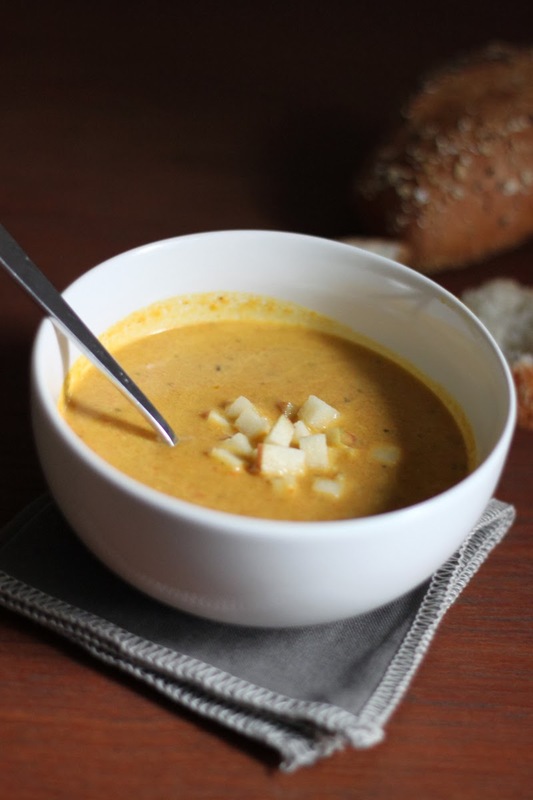 The recipe that inspired this soup calls for grating the onion on a box grater to shave cooking time, which though brilliant adds to the number of dishes! Chop the onion as finely as possible with a knife and you'll have three dishes to wash - a knife, a micro-grater (for the ginger) and a pot! NOW TO THE SOUP. Heat the olive oil in a medium pot over medium high heat. Add the onions and cook for 3 to 3 minutes or until softened. Add the ginger and cook until fragrant. Add the curry powder and salt and cook for 1 minute more. Add the pumpkin and broth or stock and bring to a boil, stirring regularly to break up the pumpkin. Remove from the heat and add the half and half. Taste and season with additional salt, if desired. Serve garnished with diced apple and hearty bread for dunking. * I used chicken stock from my freezer, but feel free to use store bought chicken or vegetable broth! Oh my.....this is making my mouth water. I love pumpkin!! Thank you for sharing Meghan, I may have to whip this up this weekend.